One of the very best things you can do to give your cat a long and healthy life is to ensure that he or she is vaccinated against common and serious feline infectious diseases. Rich with disease-fighting antibodies, a mother’s milk will give her kittens immunity from disease for the first few weeks of their lives. However, after that period it’s up to you – with the help and advice of your veterinary surgeon – to provide that protection. How do cat vaccines work? Generally, the immunity that a kitten has at birth only lasts for a few weeks. It is then time to begin vaccinating. The first vaccination is usually given in two doses, the first dose at around the age of eight to 10 weeks and the second about three- four weeks later, finishing after 12 weeks’ of age. 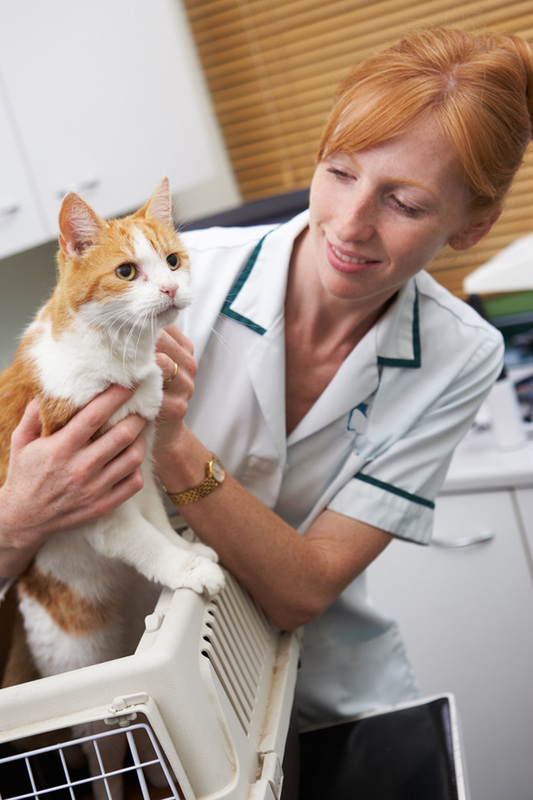 Thereafter, your cat will require annual ‘booster’ vaccinations for the rest of his or her life to maintain protection. An older cat with an unknown vaccination history will also require two doses to initiate a vaccination course. Of course, these are only guidelines – your veterinary surgeon will be able to determine the exact schedule that’s right for your cat. Your cat should be protected against those diseases which are most common, highly contagious, and which cause serious illness or death. Such diseases include feline panleucopaenia, feline leukaemia and cat ‘flu. Cat flu is a syndrome which can be caused by both feline herpesvirus and feline calicivirus. Feline chlamydiosis or Bordetella bronchiseptica (another potential cause of cat ‘flu) vaccination may also be recommended, based on your veterinary surgeon’s evaluation of the risks posed by such factors as your cat’s age, particular environment and lifestyle. What can I get my cat vaccinated against? Just as with the human common cold, the virus that causes this upper respiratory-tract infection (cat ‘flu’) is easily transmitted from one cat to another, so vaccination is imperative if your pet will come in contact with other cats. Its symptoms may take the form of fever, loss of appetite, sneezing, eye and nasal discharges and coughing. Kittens are particularly affected, but this disease can be dangerous in any unprotected cat, as effective treatment is limited. Even if a cat recovers, it will remain a carrier and in some cases can have recurrent health problems (and particulary in relation to the eyes) for life. This virus is another major cause of upper respiratory-tract infection (cat ‘flu) in cats. Widespread and highly contagious, its signs are variable and can include respiratory signs such as conjunctivitis and sneezing but fever, ulcers on the tongue and sometimes a ‘shifting’ lameness can occur sometimes without respiratory signs. Illness can range from mild to severe, depending on the strain of virus present. Once again, treatment of this disease can be difficult. Even if recovery does take place, a cat who has had the virus cat can continue to infect other animals for a considerable period of weeks or months, and sometimes lifelong, as well as experience chronic sneezing and runny eyes. Some cats exposed to this virus may develop s life-long gum disease which in some cases is so severe will necessitate removal of most of the teeth as it cannot be easily treated. Vaccination is therefore tremendously important to help prevent infection. This potentially fatal disease is caused by a virus so resistant it can survive for a year or more outside a cat’s body, on its own in the environment. Signs include: listlessness, diarrhoea, vomiting, severe dehydration and fever, like parvovirus in dogs. Certain feline panleucopenia vaccines also protect cats from catching the ‘dog’ version known as ‘canine parvovirus’. Although canine parvovirus does not cause the same horrible symptoms in cats, a cat that is not protected against feline panleucopenia virus will transmit the virus in their faeces and potentially give it to unvaccinated dogs which can kill them. Therefore it is very important to protect your cat against this disease as it will also protect dogs from getting parvovirus. Happily, the vaccine itself is very effective in preventing the disease, as treatment is very difficult and, even if recovery takes place for a period of several weeks, a cat that has recovered can still spread the disease to other, unvaccinated animals. Infection with the Feline Leukaemia Virus can result in a multitude of serious health problems: from anaemia, certain types of cancer to secondary problems caused by a deficient immune system and to complicate matters these problems may not show up for a very long time after infection After initial exposure to the virus, a cat may show no signs of its presence for months, if not years, and in this time it may infect other cats through the transmission of the virus in saliva, for example through sharing food and water bowls or biting. If your cat is not protected and you are concerned that it may be infected then testing is available to determine its FeLV status Ie if he or she has been infected. 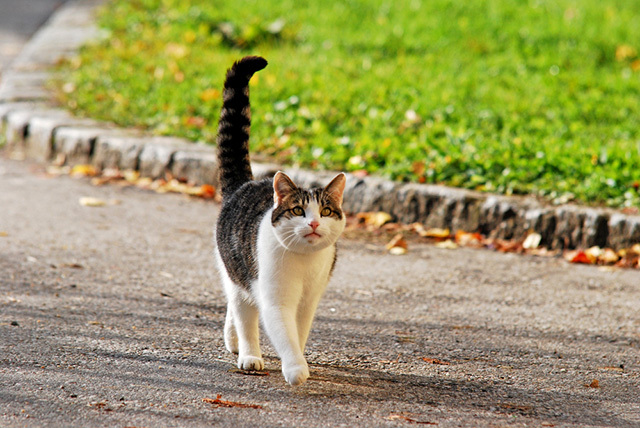 In order to ensure your cat is protected against this potentially fatal disease which is easily transmitted by infected cats, vaccination is recommended for all cats that go outdoors, even if itÕs just in the garden. What other vaccinations could my cat need? After evaluating your cat’s particular situation and risk factors, your veterinary surgeon may also recommend vaccination against other infectious diseases. This bacterial disease is the most common cause of conjunctivitis in cats. It is very contagious, especially in young kittens kept in groups and the infection rate can be very high in such environments. It causes a local infection of the mucous membranes of the eyes but may also lead to some mild respiratory signs. Chlamydiosis can be transmitted to humans by direct contact to cause typically conjunctivitis although this is rare. 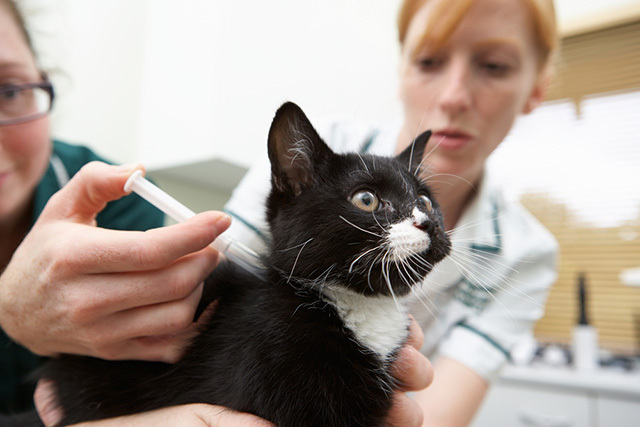 Treatment involves long courses of appropriate antibiotics, therefore vaccination is the preferred method for prevention for those cats at risk. This incurable viral disease affects the central nervous system of almost all mammals, including humans if infected. It is spread through contact with the saliva of infected animals through bites or any break in the skin. Though not present in the UK, this disease occurs widely throughout many other countries of the world. It is one of the requirements for the Pet Travel Scheme that all dogs, cats, and ferrets are vaccinated against rabies if travelling abroad. Like any drug treatment or surgical procedure, vaccinations cannot be 100% guaranteed to protect against disease. However, used in conjunction with proper nutrition, good pet management and hygienic conditions, vaccination is clearly your pet’s best defence against serious and common infectious disease. Plus, when you consider what treating a serious illness can cost you in money and distress as well as the and your beloved cat in terms of both money and distress, and even death prevention through vaccination is extremely cost-effective. Finally, when you consider the amount of money, distress and pain that NOT vaccinating can cost you and your cat and could even result in death the only sensible option is to give the best possible protection by vaccinating.